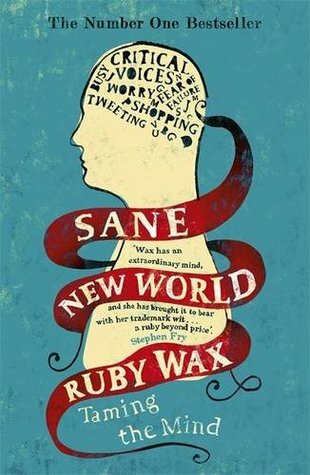 Book Description: Ruby Wax - comedian, writer and mental health campaigner - shows us how our minds can jeopardize our sanity. I picked this book up because I'm interested in psychology and was hoping to understand myself better. I can happily say this has been achieved. I only know Ruby Wax as a comedian so I was intrigued to see what she'd be like as an author. This book has many humorous parts which lightens the mood. She manages to speak openly and honestly about her experience which is really helpful for the reader as it give us an accurate insight into the mental illness of depression. At first I was cautious because I've read a book similar to this in the past and I found it quite difficult to understand. However this book was really easy to read and it had little diagrams on some of the confusing parts. When the brain functions were explained there were quirky images to show what parts were where and I found this very helpful! I also really enjoyed reading the exercises towards the end. These were ways of dealing with over thinking and negative thoughts and I personally found them very useful. They weren't complicated and easily doable everyday and if one method didn't rock your boat, you could just use another technique because she offered many exercises for everyone. Secondly a lot of information was provided abut mindfulness and cognitive therapy. This was useful because if you didn't like the idea of practicing mindfulness, there were other options too. A lot of statistics were used to support the research and methods she'd given which were reliable and accurate. Overall, I found this book very easy to read and the topic was really something I found interesting. I knew some of the basics anyway because I'm studying psychology at college but it was nice to dig a little deeper and learn abut the body and brain.. I think I learned a lot from reading this and would recommend it to anyone who struggles with mental health, wants to find out more about the topic, or is interested to learn about the concept of mindfulness.